Range of zero waste face clothes and handmade soaps made in Devon using natural and vegan-friendly ingredients. All Soap Daze soaps have a base of coconut oil, shea butter and olive oil, and have a minimum weight of 112g, which is bigger than most handmade UK soaps. 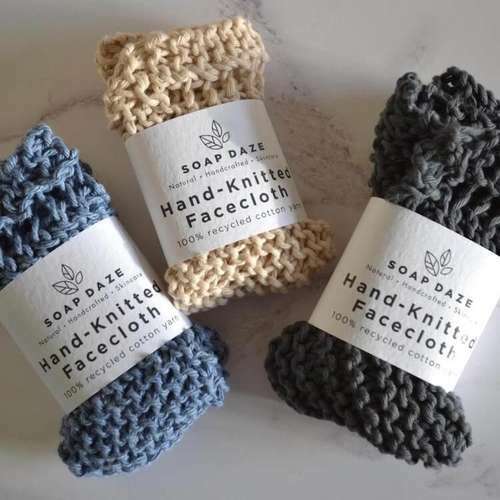 The face cloths are hand knitted using recycled cotton yarn and are great plastic-free alternatives to disposable wet wipes and makeup removers. Coffee and Raw Cacao - Made by cold pressing cocoa beans with Devon roasted ground coffee providing great exfoliation which can aid with reducing cellulite when used often. Cedarwood & Grapefruit - Zesty and refreshing. New Rose - Lovely spring rose bouquet with sweet floral scent. Black Pepper and Ginger - The black pepper has anti-microbial and antiseptic qualities and creates a warm and spicy aroma. Bergamot and Neroli - A blend of Bergamot and Neroli pure essential oils gives this soap a intense and sweet scent. Tea Tree and Spirulina - Tea Tree oil has many medicinal properties, it has an earthy aroma and is well known for its bug repelling properties. Frankincense - Make your bathroom smell like pine forests with sweet and woody frankincense. Ginger and Mandarin - The ginger oil provides a warm, reinvigorating scent to help build mental determination and focus. 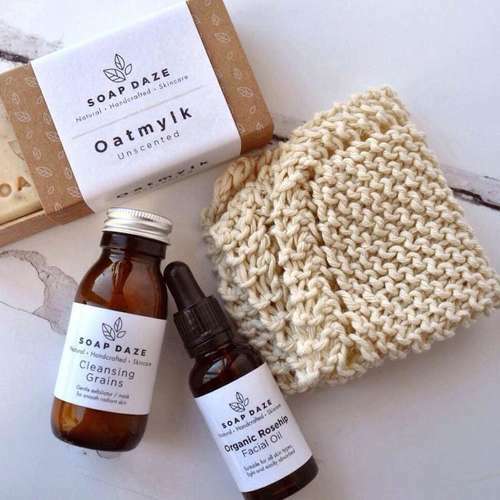 Oatmylk - An unscented gentle soap, suitable for very sensitive skin. Oats have been used in beauty care for thousands of years and can help acne, eczema, rosacea and psoriasis. Lemon & Lime - Uplifting soap great for morning showers. Lemongrass & Patchouli - Deep and energising scent with anti-bacterial and anti-ageing properties. Black Pepper and Ginger - Ingredients: Sodium cocoate, sodium olivate, sodium shea butterate, coconut (cocos nucifera) milk (organic), curcuma longa (turmeric) root powder, piper nigrum (black pepper) oil, zingiber officinale (ginger) root oil, citrus paradisi (grapefruit) oil, guar gum, naturally occurring glycerine. Constituents of essential oils: limonene, linalool. Coffee and Rawo Cacao - Ingredients: Sodium cocoate, sodium olivate, sodium shea butterate, coconut (cocos nucifera) milk (organic), avena sativa (oat) kernel meal, coffee arabica, raw cacao, citrus sinensis (orange) peel oil, zingiber officinale (ginger) oil, cinnamomum zeylanicum oil, pogostemon cablin (patchouli) oil, eugenia caryophyllata (clove) oil, guar gum, naturally occurring glycerine. Constituents of essential oils: linalool, limonene, eugenol, benzyl benzoate. Bergamot and Neroli - Ingredients: Sodium cocoate, sodium olivate, sodium shea butterate, coconut (cocos nucifera) milk (organic), citrus bergamia (bergamot) fruit oil, citrus aurantium dulcis (orange) flower oil, guar gum, naturally occurring glycerine. Constituents of essential oils: limonene, linalool, geraniol, farnesal. Ginger and Mandarin - Ingredients: Sodium cocoate, sodium olivate, sodium shea butterate, coconut (cocos nucifera) milk (organic), citrus nobilis (mandarin orange) peel oil, zingiber officinale (ginger) root oil, poppy seeds, guar gum, naturally occurring glycerine. Constituent of essential oils: limonene. Tea Tree and Spirulina - Ingredients: Sodium cocoate, sodium olivate, sodium shea butterate, coconut (cocos nucifera) milk (organic), melaleuca alternifolia (tea tree) oil, mentha arventis (peppermint) oil, eucalyptus globulus, spirulina platensis powder, guar gum, naturally occurring glycerine. Constituents of essential oils: linalool, limonene. Frankincense - Ingredients: Sodium cocoate, sodium olivate, sodium shea butterate, coconut (cocos nucifera) milk (organic), boswellia carteri (frankincense) oil, ground cinnamon, citrus sinensis (orange) peel oil, myrista fragrans (nutmeg) oil, eugenia caryophyllata (clove) oil, guar gum, gold mica, naturally occurring glycerine. Constituents of essential oils: limonene, eugenol. Oatmylk - Ingredients: Sodium cocoate, sodium olivate, sodium shea butterate, oatmylk (aqua, avena sativa, helianthus annus seed oil, calcium, sea salt, carrageenan, iodine, vitamin D2, vitamin B12) avena sativa (oat) kernel meal, naturally occuring glycerine. New Rose - Ingredients: Sodium cocoate, sodium olivate, sodium shea butterate, citrus sinensis (orange) peel oil, pelargonium graveolens (rose geranium) oil, aniba rosaeodora (rosewood) wood oil, pogostemon cablin (patchouli) oil, naturally occurring glycerine. Constituents of essential oils: citral, linalool, limonene, geraniol, farnesol, citronellol, benzyl benzoate. Cedarwood & Grapefruit - Soap ingredients: sodium cocoate, sodium olivate, sodium shea butterate, cedrus atlantica (cedarwood) oil, citrus paradisi (grapefruit) oil, rosmarinus officinalis (rosemary) oil, naturally occurring glycerine. Constituents of essential oils: linalool, limonene, citral. Product Packaging - Kraft card, shredded paper and cardboard gift box. 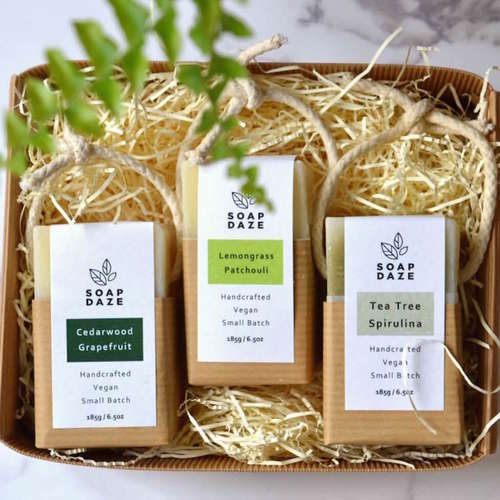 Soap Daze was founded by Sharon, who has a passion to make wholesome soaps and skincare products that have honest natural ingredients which are kind to your skin and the environment. All Soap Daze's products are lovingly handcrafted in small batches in her garden workshop in Devon using plant oils, essential oils, herbs and spices. Delivery Packaging - Cardboard box, paper fill if necessary.